Making an impressive return, with new shells, tom mounts, lugs and hardware package, the Export shakes up the scene again with its cutting-edge drums and hardware at a blinding price. Great value for money. Excellent hardware package. Asian mahogany sounds great. Snare and cymbals are weak links. The arrival of the Pearl Export in 1982 changed forever the drum kit market. Here was a top quality entry-level kit that set a new benchmark. Within a couple of years every other manufacturer was vying to compete. The original Export shaped almost every generic starter kit for almost 30 years. Pearl had already shipped one million Export kits by 1995! Each year the spec was improved until eventually Pearl brought out the Forum to restake its starter position. Then in 2007 the Export name itself was dropped in favour of Vision, while Target took up the starter slot. So you had Target-Forum-Vision. Now Pearl has re-introduced the Export name and dumped Forum, so we have Target-Export-Vision. "This is not just a re-badged Forum - we have upgraded shells, new lugs, new tom bracket and a superb hardware package"
It may be the budget kit in Pearl's range, but it is what we always expected from the Export moniker, a bargain kit with the latest refinements. This is not just a re-badged Forum. No, we have upgraded shells, new lugs, new tom bracket and a superb, improved hardware package. Let's start with the shells. The Forum had six-ply, 7.5mm poplar shells - as did the previous Export from 2000. The new Export has six-ply 7.5mm hybrid Asian mahogany and poplar shells. 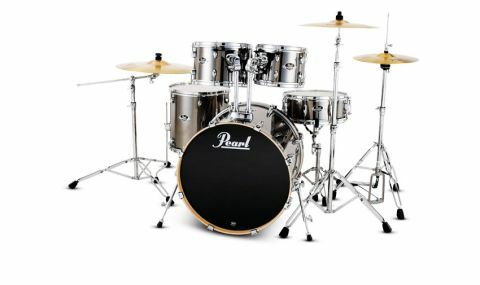 From 2005 Pearl branded its shell-making process Superior Shell Technology (SST) and Pearl uses this same heat-moulding method to make all its shells, throughout its different lines. What marks Pearl out from other major manufacturers is its use of traditional scarfed jointing, where the shell plies are brought to a long graduated overlap rather than simply butting up head-on. You can examine this scarfing on the shell insides and it makes a pleasing change from almost all other modern shells. The inners are also now a rich, open-grained reddish colour courtesy of the Asian faux 'mahogany'. This is not the expensive real mahogany of Pearl's top ranges, but it's attractive nonetheless. The 45° bearing edges are smoothly sanded and level all round. Putting a ruler across the shells reveals they are also acceptably circular. Our review kit is 22"x18", 10"x7", 12"x8", 14"x14" with matching wood 14"x51⁄2" snare drum. This is one of four possible set-ups, all of which have the 14"x51⁄2" snare. One alternative is the same as this kit but with a 20"x18" bass drum, while the other two alternatives have 16"x16" floor toms with 10"x7" and 12"x8", or 12"x8" and 13"x9" mounted toms. You can extend your kit by adding any individual drums including the additional sizes, 24"x18" bass, 18"x16" floor tom, 10"x8" and 12"x9" toms. That's a pretty impressive range. And you can choose from five wrap finishes: Jet Black, Red Wine, Arctic Sparkle, Electric Blue Sparkle and the sleek Smokey Chrome of the review kit. Turning to the metal work, the re-launched kit is distinguished by a new and smaller, sculpted lug with a reduced 'footprint' allowing the shells to breathe better. The snare has eight larger, double-ended bridge lugs. There's a basic strainer with small tension knob that works smoothly. All around the chrome work gleams and the enclosed bass drum claws, with their rubber gaskets, are especially classy. The two mounted toms come fitted with Pearl's new Opti-Loc isolation bracket. This is an improvement on the previous somewhat iffy Integrated Suspension System (ISS) because, while it clamps onto just two upper lug bolts, it forms an equilateral triangle with a lower fixing point which is bolted through one of the tom's two air vents. This rather nullifies the idea of resonance isolation, but since such brackets are thought indispensable these days it is at least stable. The toms are in any case fixed on the bass drum via Pearl's trusty old twin post mounts, which go right back to the original Export. When it comes to the 830 series hardware pack we have no quibbles. It's brilliant. The stands have new Trident design tripods, new collar housings and contoured wing nuts that make adjusting a joy. And the best thing is the snare and cymbal stands have new Uni-Lock, infinitely adjustable tilters - no gears to prevent you achieving the exact position you crave. It's a shame the tom posts are geared and don't have Uni-Lock joints, yet. "Probably the most exciting item is the modernistic brushed silver and orange Demonator bass pedal"
Probably the most exciting item is the modernistic brushed silver and orange Demonator bass pedal. This is an offshoot of Pearl's professional Eliminator Demon pedal, first seen in 2009, and benefits from some of that pedal's multi-adjustments. It's a single-post design with single chain and interchangeable cam drive. Out of the factory it has the orange plastic 'V' cam installed. This has an off-centre action which accelerates towards the head. You can remove the orange gizmo using the included hex wrench leaving you with a constant 'perfect circle' action. You may have to raise the action of the long footboard slightly to accommodate this - easily achieved by the drum key nut atop the single post. Also, the footboard has Pearl's Powershifter capability which allows you to move it forward fractionally by re-positioning two grub screws underneath the heel hinge. Most budget kits at this price (including the Forum and the previous Export) have poplar shells, poplar being a softer substitute for maple. Pearl has reintroduced Asian mahogany into the mix and that inner lining of semi-hard red wood is not just cosmetic but adds warmth and depth to the shell tone. The tom heads are Chinese-made transparent Remos and deliver the requisite blam with oodles of depth and authority. The bass drum has a Powerstroke-style batter and with the Demonator pedal fitted you feel empowered, totally current and professional. The pedal has a most direct, clean and fast stroke with a cleverly angled DuoBeat felt-plastic beater for full head contact. As ever with budget kits, the snare is the slightly weak link. It is quite lightweight and took some judicious tuning before eventually yielding a decent sound. But the rest of the drums sound little different from a kit three times the price. Optionally completing the package is a set of four brass cymbals - a 20" ride, 16" crash and 14" hi-hats, as previously offered with the Forum. While you can get a professional sound from the drums, you won't from these cymbals. We've heard (much) worse though, and the hats and even the short-on-sustain crash will get you started. Still, you can buy an Export without these cymbals, which, if you can afford the extra for a commensurate bronze set, is the way to go.